When you draw this card, if you have no other cards in your hand: You can reveal this card; Special Summon this card from your hand. When this card is Special Summoned: You can add 1 "Infernity" card from your Deck to your hand. You must have no cards in your hand to activate and to resolve this effect. Infernity Archfiend appears in the artworks of Infernity Launcher and Wave-Motion Inferno. 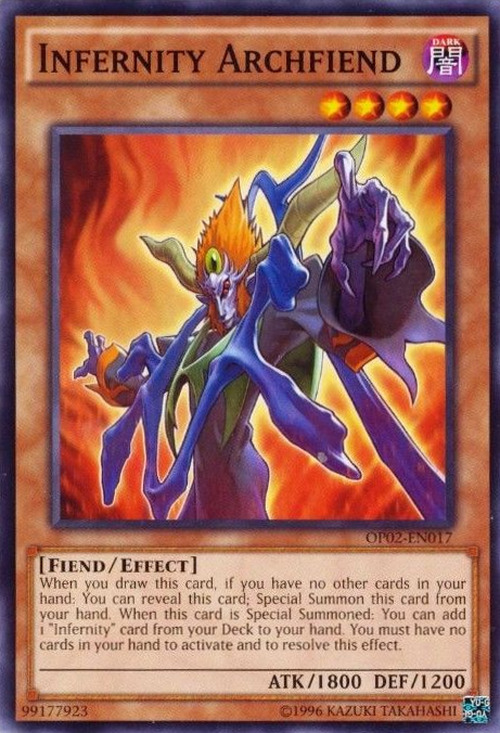 This is one of the few demonic-like monsters to not have its horns removed in the TCG. Infernity Launcher: You can add "Infernity" cards that are not monsters to your hand with the effect of "Infernity Archfiend", including "Infernity Launcher." Infernity Randomizer: Drawing a card and inflicting damage occur sequentially, not simultaneously. If you draw "Infernity Archfiend" you will miss the timing to activate its Special Summon effect. Witch of the Black Rose: If you activate the effect of "Witch of the Black Rose" while you have no cards in your hand and you draw "Infernity Archfiend," you can activate the effect of "Infernity Archfiend." If you activate the effect of "Witch of the Black Rose" while you have no cards in your hand and you draw "Infernity Archfiend," you cannot activate the effect of "Infernity Archfiend." The effect "Special Summon this card from your hand." can be activated even during the Damage Step. The effect "You can add 1 "Infernity" card from your Deck to your hand." can be activated even during the Damage Step. Even if you draw multiple "Infernity Archfiends" with the effect of "Pot of Greed", etc. while you have 0 cards in your hand, you can only activate the effect of 1 "Infernity Archfiend" to Special Summon itself. : If I draw multiple "Infernity Archfiends", can I Special Summon all of them? If multiple cards including "Infernity Archfiend" were drawn by an effect like "Card Destruction" or "Reload", then "Infernity Archfiend" was still drawn while you have 0 cards in your hand, so you can activate the effect of and Special Summon "Infernity Archfiend". : If "Infernity Archfiend" is drawn by an effect like "Card Destruction", then can it be Special Summoned? If you have one or more cards in your hand when resolving the effect of "Infernity Archfiend", then you cannot add an "Infernity" card from your Deck to your hand. : If you have one or more cards in your hand when resolving the effect of "Infernity Archfiend", then can you add an "Infernity" card from your Deck to your hand? Infernity Barrier: If the only monster you control is 1 "Infernity Archfiend", and it was destroyed by battle with the opponent's "Airknight Parshath" and you took battle damage, since the effect of "Airknight Parshath" is activated before the "Infernity Archfiend" that was destroyed by battle is sent to the Graveyard, "Infernity Barrier" can be activated. : If the only "Infernity" monster I control is destroyed by battle, can I activate "Infernity Barrier" during the Damage Step? Infernity Randomizer: The effect of "Infernity Randomizer" which has you draw and the effect which inflicts damage equal to the drawn monster's Level x200 are not treated as resolving at the same time. Thus, if you draw "Infernity Archfiend" by the effect of "Infernity Randomizer", then you cannot activate the effect of "Infernity Archfiend" which Special Summons it. : Are the "draw" and "inflict damage" effects of "Infernity Randomizer" treated as being done at the same time?